Ayurveda, the 3000 year old science, established as an alternative system of medicine has much relevance and importance. The fast life style and food habits, along with stress and strain in everyday life are the biggest challenges to the health and well being. The ayurveda offers both treatments and rejuvenation ; making it appealing to those aspiring to rejuvenate themselves. The treatments are proved to be effective for many lifestyle disorders and chronic ailments. The side effects and other surrounding issues are minimum. There are many forms for treatments and the mode of treatment depend upon the nature of diseases and health of the undergoing person. The rejuvenation therapies suits everyone with general health standards. We strive to estabilish prime health in every person be it physical, mental or Spiritual. This is achieved by establishing an energitic equilibrium in the functions of the body humors, and simultaneously through an alteration in life style in conformity with the simple laws of nature. 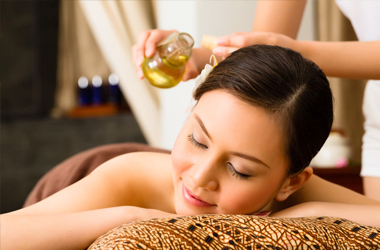 Find the ayurvedic treatment/rejuvenation program suitable to you from our list of treatments. No ayurvedic program is complete unless it is supported by a well structured Yoga and meditation program. We have a highly skilled Yoga Guru who conducts daily classes. Special need / private classes can also be arranged by prior appointments. Some of the therapies and treatment on offer include those for rejuvenation, purification, immunization, stress management, weight loss among others. Feel the pressures and tensions seep out of your mind and soul.